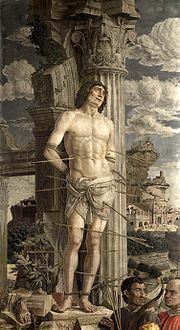 An Italian painter and printmaker, Mantegna’s work is characterized by a preoccupation with antiquity unique to his age. Many of his paintings and engravings display classical architectural details in complete and ruin form and often include complex perspectives. Religious subjects are frequently juxtaposed against a landscape of towering hills topped with classical architecture. His body of work is also made unique by the fact the he, like few others, left a great deal of self portraits behind.